Material determines quality. Our Buzio waterproof bathroom shower curtains are made of high-density polyester, it stays dry and clean, protecting your bathroom from mold, mildew and bacteria, so that you will enjoy your bath time. We use high quality eco-friendly ink for printing, there is no toxic or odors (better than the PVC, vinyl or plastic shower curtains), providing a safe and healthy environment for you and your family. It comes with 12 long-lasting metal grommets that will keep the curtain attached without rusting, and 12 free high quality shower curtain hooks make it easy to install and allow the shower curtains to smoothly open and close without hiccups. Moreover, the weighted hem at the bottom will keep the curtain in place while taking the shower. 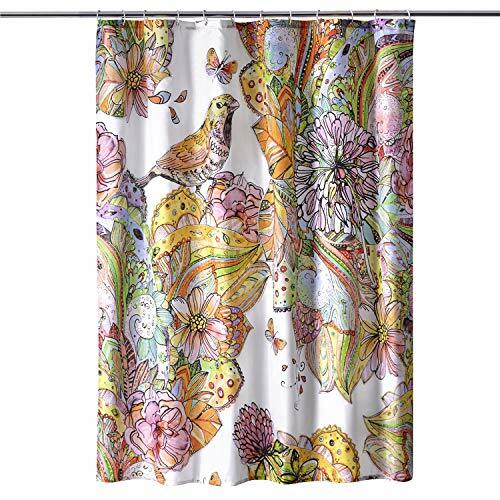 The simple design of the shower curtains is made to fit most bathtubs and showers. Select your favorite design to decorate your bathroom and enjoy your bath time from now on. It is hand/machine washable in cold water, no bleach or tumble dry. If you have an issue, do not hesitate to contact our friendly customer service. ☞ Please allow 1-3cm error due to manual measurement and make sure you do not mind before ordering. ☞ Due to differences in computer monitors display, there can be color variations between the actual product and your screen.